Discussion in 'Conspiracy Theories' started by Mick West, Jul 4, 2012. 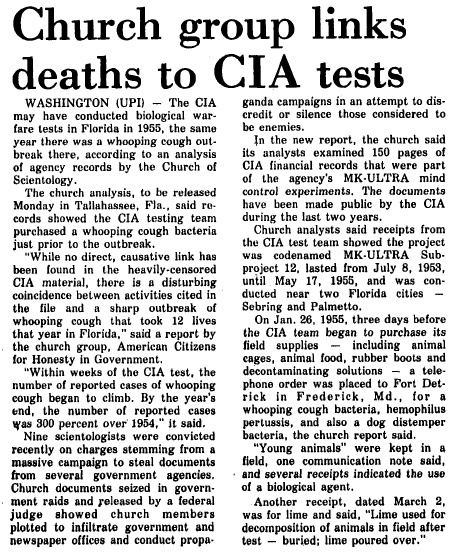 In 1955, the CIA conducted a biological warfare experiment where they released whooping cough bacteria from boats outside of Tampa Bay, Florida, causing a whooping cough epidemic in the city, and killing at least 12 people. ^ a b c Blum, William (2006). Rogue state: a guide to the world's only superpower. Zed Books. pp. 150–151. ISBN 978-1-84277-827-2. So the entire story seems to be based on a a propaganda campaign by the Church of Scientology. 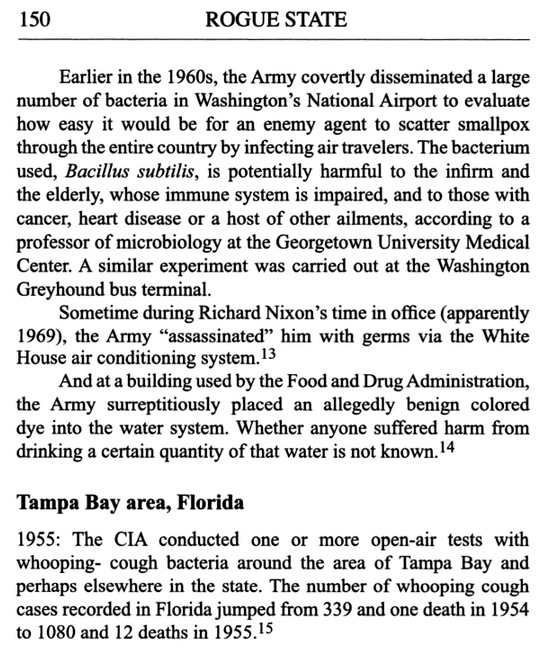 They did not even claim to have any direct evidence that anything was spray, simply some accounts of an unknown quantity of bacteria, and a bunch of unrelated things like animal cages. They noticed this was a year when the whooping cough cases were higher than the last year, so they tried to paint a picture. So there's no really evidence of what did, or did not happen. But it's nowhere near as clear cut as the Wikipedia references claim. You missed the part that states that the US govt. convicted the church of scientology for stealing documents. That suggests that the scientology claim has some merit. At the very least, this cannot reasonably be debunked out of hand. You missed the part that states that the US govt. convicted the church of scientology for stealing documents. That suggests that the scientology claim has some merit. Why? If they stole documents it says nothing at all about what was in those documents. They could have been anything. From what I understand, the Church of Scientology's main goal was to steal documents about itself. Are there any existing lists of the actual documents taken? The statement by the church itself says there is no direct link between the documents and the allegation - just supposition and suspicion. Is the claim currently being circulated or was the post addressing an old claim (such as the wikipedia reference)? Well, I wrote it three years ago. I suspect I was just addressing the Wikipedia claim at the time. Woah, you did too. I thought this was a new thread, my mistake. If every source comes back to the Scientology article's unsubstantiated claim, it's safe to categorise the story as untrue.